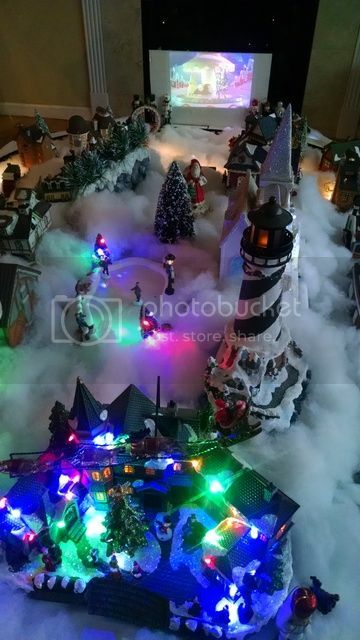 LETS SEE THOSE VILLAGES/DISPLAYS - Christmas Villages - PlanetChristmas! Just a thought but would love to have a virtual village tour for those that put up villages. My family always says I put up the village and never have anyone over to view it. It seems like Village collecting has dropped off over the years, but it is one of my families favorite Christmas things. 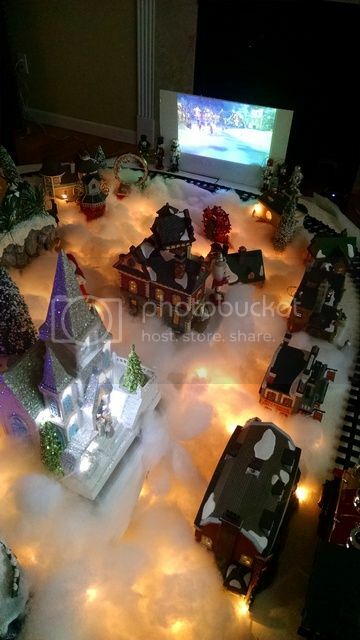 I put up a static outdoor display with about 10000 lights but my love is Snow Village. As it stands now. Or until I add more things to it. : ) Can't seem to leave these things alone. It's not a tour, just one photo. With boxes. Still have a lot to set up inside and out. It looks like it has been a long time on a reply so here goes. 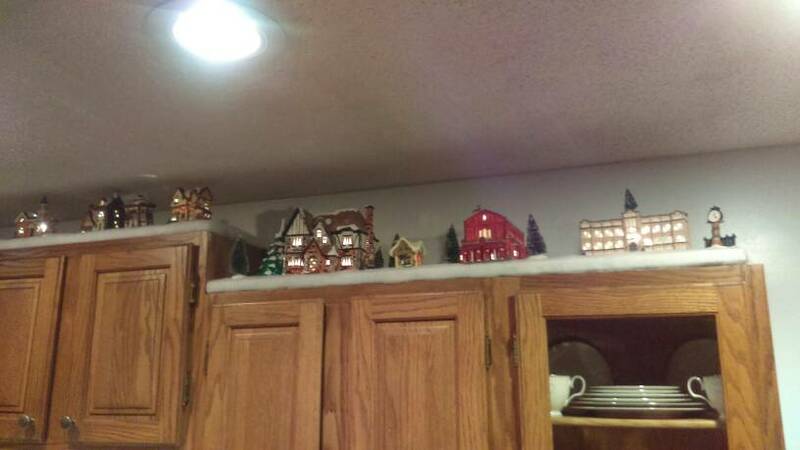 I too love Christmas Villages. I have been collecting them for awhile now. My most recent find was 22 Dept. 56 pieces that I got for about $380.00. I was trying to figure pout how I was going to display them this year and came up with this idea. Tell me what you think. Remember this is nor the final setup because I need to cover the shelves and get some trees. Well I have been researching the value of the Dept. 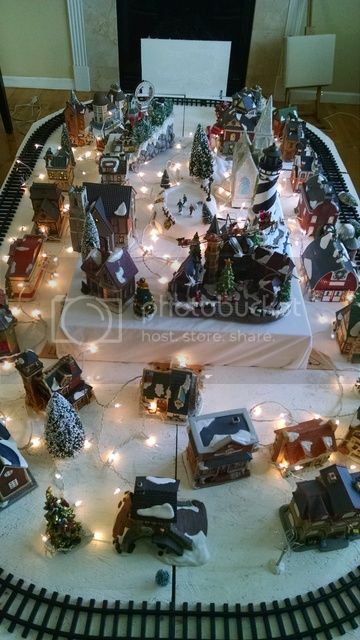 56 Snow Village pieces that I got for $380.00. 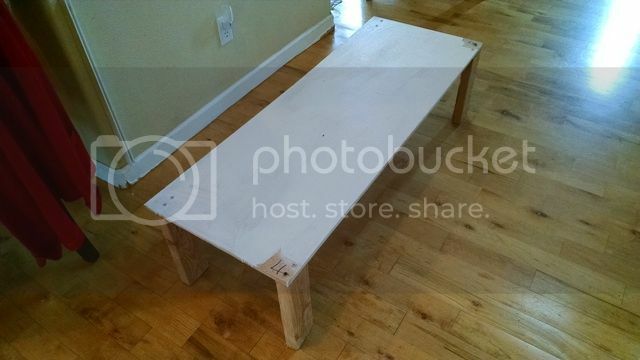 From what I can find on line to replace what I have would be $1556.00. I think I made out like a bandit. The shop I got them from has extended me the offer to put anything I find on lay a away. I will be going tomorrow to see what he is bringing in. This is not all of the villages I have so there will be more to come. Okay things are getting closer tho it may not look like it. I still have a lot of work but it will be worth it. I had to start mine early this year fora party but here it is. 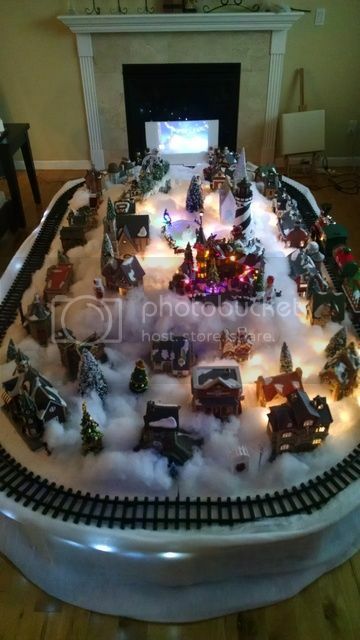 Took me all of last year (after Xmas) so I could get the village for an affordable price, about $500 for everything you see. I didn't want to use the supplied light becasue that would mean too many plugs to connect, so instead I used icicle lights and every used the branches to illuminate thehomes. Quite easy actually and the unused branches of lights served to glow the surrounding area. Hey Vic, welcome to PC..I don't have the village stuff but LOVE what you have done. Is the train Lionel? My mantel is getting full. 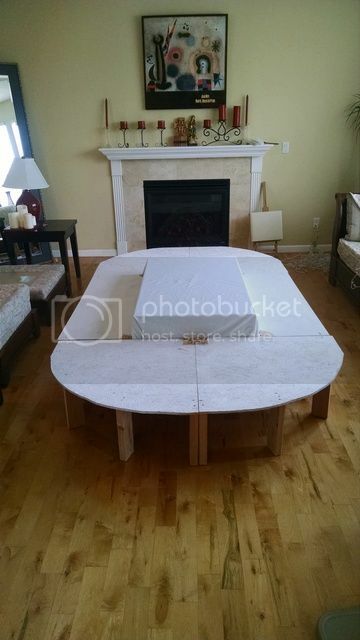 I want to do a large display in the center of a room. Any ideas as how to? I don't have the space... Suggestions? Nicely done Vic. I love the projector. Looks like a drive-in. Nice and simple. Well I'm making progress on all of mine. I still have a lot more to do but It is starting to take shape. Well got more done on the villages. Still a lot more to go. 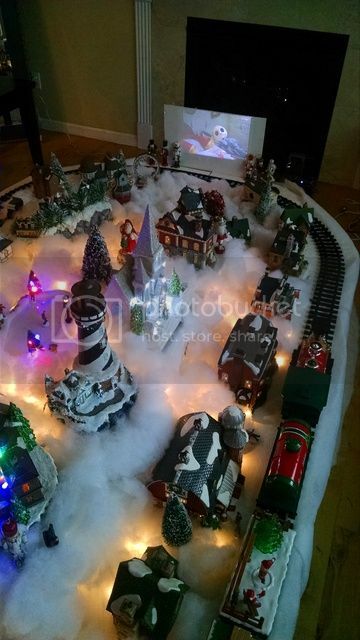 This is mine from last year, moved into a new place and my village wont be displayed this year. 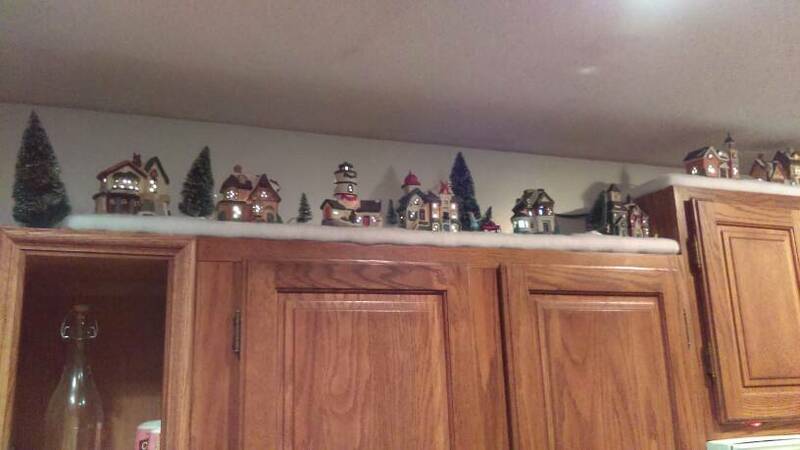 My collection is St. Nicholas Square from Kohl's. That is a great display. I love it. Still working on my setup but getting real close to being done. 2016 village, or the monster that's eating my living room! 78 inches wide. 46 inches deep and 45 to the tallest platform. 52 buildings with 48 of them lit. The power to all the lights are controlled by two dimmer switches. Keeps all the buildings from glowing like toxic waist. I also hid four cows and one donkey within this display. First pic is the overall village. Second pic shows some of the details. 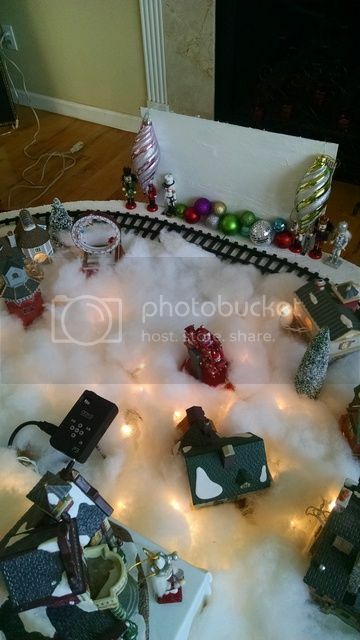 I used evergreen garland behind each row of buildings. Quite a few of the trees are hand made. Looking at the bottom right you have one store bought bottle brush. The next three are hand made. From right to left. Dryer lint. Toilet paper mache' and air dry clay. The third pic is one of the four cows hidden in the display. This is proof you don't have to spend a lot to have a village. This amount has taken me five years to accumulate. This isn't all the buildings I have. The average cost of each building is just over $3.00. Auctions, thrift stores and yard sales. I started out with eleven buildings at $2.50 for each one. Great display. I too have looked at thrift stores and yard sales over the years and to my knowledge I have spent about $500.00 for all that I have. It takes a long time to get to where y0u have as many village pieces as a lot of people have. To me that is the fun of collecting villages. Great job o the display. Awesome Doug! Yep, fun to collect. But gets out of hand really quick. : ) I have somewhere over 60 full size buildings. Then added 15 of the small ones I use as the residential area on the upper side of the hill to the collection. Paid a wapping .50 cents each for em. And as far as village people go I use every size I have. Everything from the really small under two inch to the four inch or better ones. Right next to each other. Need to look for more things to hide on the streets. Need a dinosaur our two. Maybe some other holiday stuff. Like Halloween and Easter to toss in the mix. People get a kick out finding the cows. For me I get the biggest blast out of setting this thing up. I only have four things I plan for. A residential area behind and above the town that uses small buildings to represent houses. A forest area between the park and two story school building. A park area. And having churches at the highest points. Everything else is up for grabs. Usually changes three or four times before it's fully set up. And takes a few days. Because I'm having two much fun with it. Using dimmers means the light bulbs don't get hot. This lets me use a 25 socket C7 light strand and a few 7 socket bubble lights strands. Along with the standard five light and single light braced strands designed for these buildings. As few cords as possible dangling below. 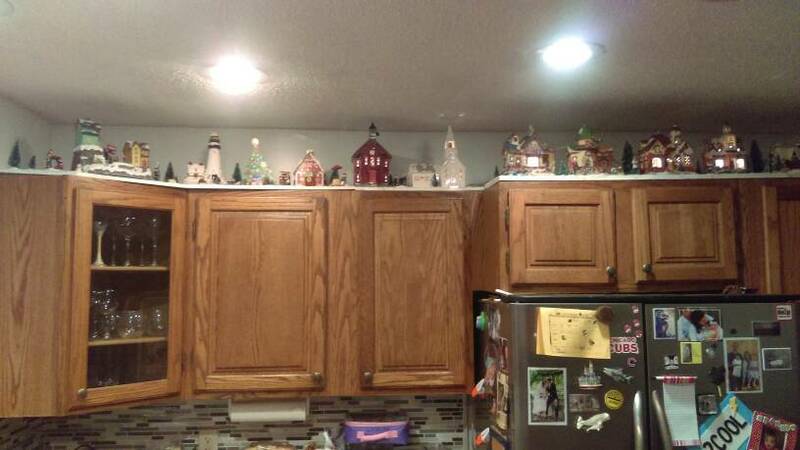 I get the dimmers at Lowe's. They are designed to dim the light from one lamp. Up to 250w. I use two of the them to stay well below the safety threshold. This keeps that odd glowing building look down. And because the bulbs are burning low the light itself is a warm gold color. The pic below is a good rep of what the dimmers give you. There is still some glow from the thinner buildings. But nothing like the glow from a fully powered C7 bulb. Just wish I could capture the over all warm glow. Our village is much smaller than many of yours, but we did have a giant rodent stop by this year. I used to raise those giant rodents for a pet shop back in the early 50's never dreaming we would still have hamsters the day we retired in May 1999. I don't recognize the buildings in your display, who made them? Thanks for the information. I remember there were several PC members that used the Lemax buildings and displayed their villages in past years. Been collecting this for a while now and still don't have a table big enough. Ended up setting up 3 displays. Can't wait till I can put them all together. Some awesome stuff here. Can't wait to get mine going. Maybe next weekend. We'll see. I've got some room to build mine over another cabinet. Mix of just about everything I've found over the years at yard sales. I've even got a replica of my church and high school.